Summon: Put a Firebolt into your hand if the top card of your deck is . Cunning Ally is a common Intelligence creature card. It is part of the Core Set. 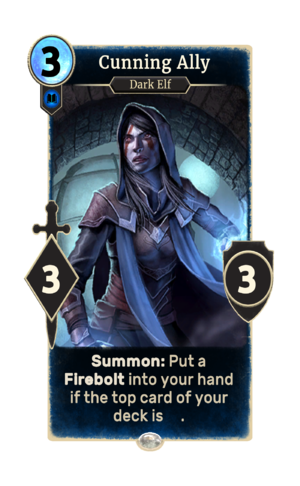 In addition to the card's availability in the Core Set, three copies are included in the Ancano's Cunning theme deck, and two copies in the Dunmer Avengers deck. "Let's shed some light on the problem." This page was last modified on 11 March 2019, at 03:55.